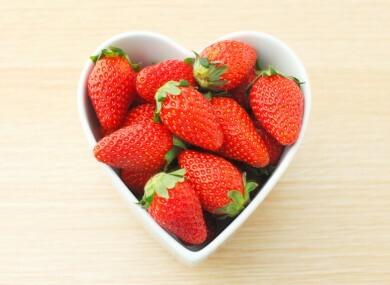 Strawberries, red peppers, apples – if it looks like a heart, get it into you. NUTRITION EXPERTS IN the US are advising people to eat more heart-healthy foods, with one simple tip – if it looks like a heart, it’s probably good for it. Though some dieticians rave about the virtues of red wine and dark chocolate for heart health (and that might sound pretty good to us), Katie Eliot, assistant professor of nutrition and dietetics at Saint Louis University, has a different plan. Strawberries and raspberries are loaded with vitamin C and an antioxidant known as poliyphenol that prevents plaque from forming. Cherries also contain an antioxidant called athocyanin, which is thought to protect the blood vessels and is high in potassium, which lowers blood pressure. Tomatoes and red peppers are rich in lycopene, which is in many red fruits and vegetables and works magic by neutralising free radicals. For fiber, turn to acorn squash and apples as these can reduce bad cholesterol that can clog up your arteries to cause hear attacks and stroke. While the normal recommendation is to eat at least five fruits and vegetables a day, Eliot recommends that for the month of February and with Valentines Day coming up, make two of these a heart-shaped or red choice. “It’s a happy coincidence that many of these foods actually resemble the organ they help to protect,” she said. Email “Eating heart-shaped foods will keep your ticker in good shape”. Feedback on “Eating heart-shaped foods will keep your ticker in good shape”.